Discussion in 'The Grumble' started by cjmst3k, Mar 28, 2019. I have a painting which arrived and it was previously framed. 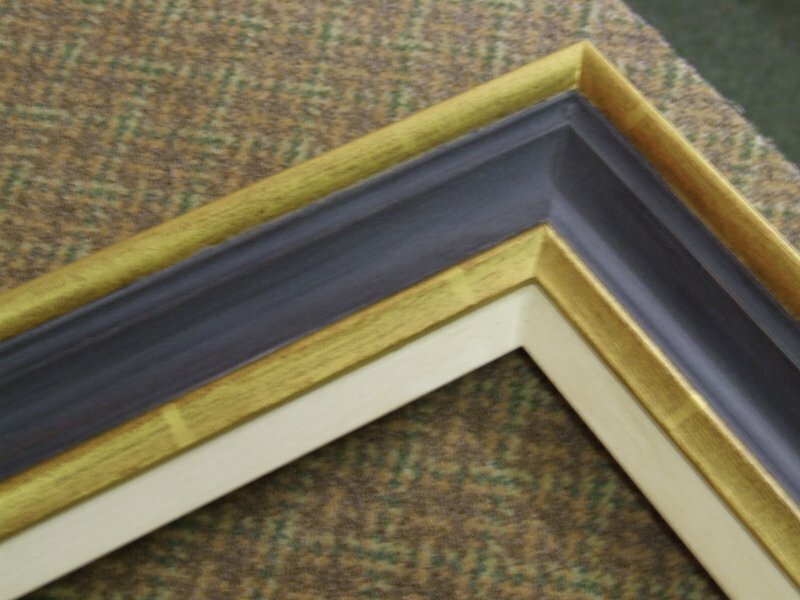 I do not have information on who made the frame, but all the telltale marks of a high quality frame. The corners are finished, and do not appear hand carved. Even the raised fillet is finished corner (except for a broken open corner), and the back edges has a custom depth. How can I test this to see if it is genuine gold leaf? If it is gold, a fine job of covering up the patina was done. The bands indicate leaf, but from the photos it is difficult to tell if's metal leaf or gold. what are some details to look for in general to make that determination??? If the leafs are 2 3/4 " length to overlaps and are all the same , most likely real gold. I have samples of both gold leaf and metal leaf from finished corner companies like APF Munn and I deal extensively in metal leaf chops from Munn Frameworks. There is no mistaking the underlying "glow" patina of gold leaf, even with antiquing "mud". Antique reproduction in metal leaf is excellent and the right color, but side by side you can't miss the difference. As I said, though, it is difficult to tell if the finish is really covered up from soil over the years. What is the stuff that looks like gold leaf? I sell some budget stuff like Decor 5042 that has loose foil on the back but at it's budget pricing, it can't be the real stuff. The frame is overly patinaed (dirty) for a true 22-23K gilded frame. There are no highlights showing through on the top surfaces of any of the carving. The flat panel of the liner does not go with a 19th century frame. The lap marks can be simulated to look like real gold. I would also like to see the back side of the frame. My first impression is that it is a metal leaf replica frame. Looks like it has the lap lines of hand laid leaf. Like munnframeworks says, real gold should be about 2 3/4". Imitation is twice that wide. You'd think there would be some identification on the verso of a high end frame. Otherwise I don't know how you could verify real leaf vs imitation besides appearance. I suppose metals other than gold would be more reactive but I don't know how you would test that outside a lab or without possibly damaging the frame. Have you had the painting out? Sometimes it's easier to see whats going on with the metal along the inner edges of the rabbet. Metal leaf can also be cut down to 85 x 85 mm (2 3/4" square) before application to fool customers. There appears to be an overabundance of skewings used on the concave portion of the profile. A professional gilder would not allow that in such a highly visible area. I doubt the words "Decor" and "real gold" have ever been used in a sentence before. I'd be surprised if someone combined real gold leaf with that bright white middle panel, (but it's a funny world). Leaf marks at 2.75 repeating confirmed. Gold tone is soft and muted but not too dirty. I don’t see any repeating patterns that indicate anything mass produced. The fillet over the liner is finished corner too. Everything about this frame screams “museum”. The scale is monsterous, and weight is very heavy. Two adult men are having trouble moving it. It’s also 6’ square. I don’t doubt it is Munn or similar (don’t think it’s Regence) because other finished corner frames when the depth needed to be deeper, Regence did a similar depth build up. I just took the paper off the back. It has a gallery sticker from Spain. But possibly framed in US. The liner area (which has a lot of reinforcement) has T12210 5/25 penciled on the back. it's probably real gold on the front. This one isn't even leaf. Bronze powder bound in varnish. I painted the laps on. alacrity8, Keith L Hewitt and neilframer like this. This one isn't even leaf. I painted the laps on. And that's what makes it 'faux' and not 'fake'. cvm and David Waldmann like this. He's a tinker, 'cause he Tinks a lot!! However a few years ago at the WCAF there were some corner frame samples that had 2-3/4" overlaps and they were really metal leaf. And one supplier had a big photo at the end of their booth that said gold leaf, and the spacings were around 5" wide - obviously not real gold leaf. Rhonda Feinman saw this frame on the FB "underpinner" page and she confirmed it is gold too.